The most recent information from the U.S. Bureau of Labor Statistics (BLS) indicates that the outlook for the court reporting profession will remain relatively positive over the next few years. Approximately 22,000 court reporting positions existed in the United States at the end of 2010, according to the data compiled by the BLS. In March 2012, the agency’s analysts released a report asserting that they expect this figure to grow by about 14 percent over the next few years. If the modest but steady rate of growth projected by the BLS is matched by market conditions, the total number of court reporting jobs in the United States could increase by more than 3,000 by the end of the year 2020. The strong outlook for the court reporting profession led the job search service CareerCast to rank “court reporter” sixth on a list of the 10 best jobs that are open to individuals who hold the requisite skills and certifications, but may lack a four-year degree. Paralegals and legal assistants also made the list, with a much larger base – over 250,000 – and a slightly higher growth rate of 18 percent attributed to the field by the BLS report. When charged with examining witness testimony, these legal professionals depend on court reporters to provide them with accurate deposition transcripts. In addition to traditional transcription services, a modern court reporting agency can also provide deposition videography. What’s driving the demand for transcription and videography services? It is critical for legal professionals to have an accurate understanding of events in order to effectively advocate for their clients. 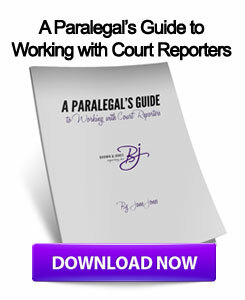 Court reporters create comprehensive transcripts of what is said during court depositions. These documents allow attorneys and their staff to scrutinize individual statements and refine their understanding of a case’s details. Additional insight can be gleaned from witness testimony through the use of video deposition services. Beyond catching the words that are said in court, trained legal videographers capture every visible and audible detail. This additional perspective can be quite useful. With both written and recorded transcripts, attorneys will have two angles from which to consider witness testimony. This allows a more well-rounded analysis than would be possible with only one account of a deposition. When it comes to typed deposition transcripts, even the most detailed account is not fully able to convey every aspect of a witness’s testimony. Supplementing the written record with a video of the deposition will ensure none of the event’s details escape notice. Court reporting companies can also provide legal professionals with other litigation services, including video conferencing capabilities. Quality reporting firms can even provide their clients with access to private office facilities, which can help make sure that a deposition, meeting, video conference or interview goes smoothly. Experienced, in-house deposition reporters and legal videographers will be on hand to create transcripts of the day’s events. The full range of transcription and videography services are also available in non-legal settings and there are many situations in which it can be useful to have a word-for-word account of proceedings. Court reporters can create written or recorded transcripts of public hearings, corporate meetings, seminars or any other events. This entry was posted on Thursday, January 24th, 2013 at 6:32 am	and is filed under All Posts, Court Reporting News. You can follow any responses to this entry through the RSS 2.0 feed. You can skip to the end and leave a response. Pinging is currently not allowed.